Dan Cathy, president and CEO of the fast food restaurant chain Chick-fil-a, entertained a Samford University audience during a Feb. 18 convocation. 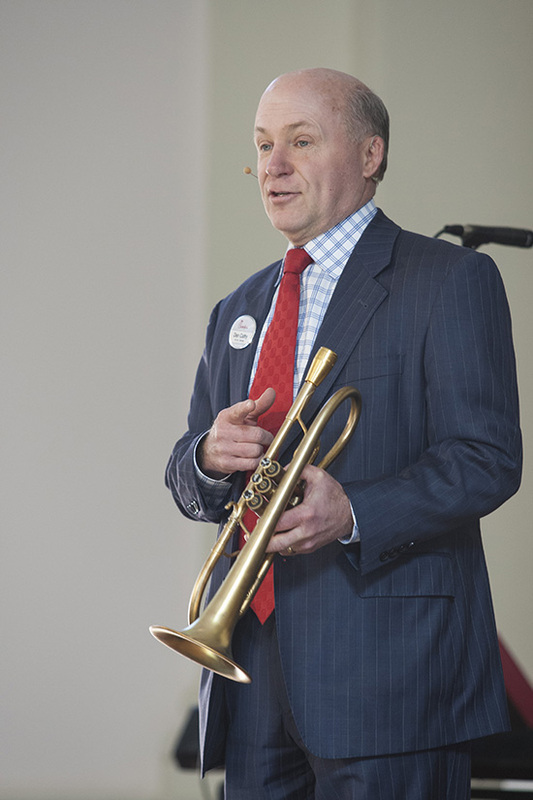 A well-known music lover, Cathy joined Samford's Jazz Band and Samford President Andrew Westmoreland on stage for a brief performance. With the addition of Cathy on flumpet-a cross between a flute and a trumpet-and Westmoreland on trumpet, the band played "Feels So Good" by Chuck Mangione. Cathy also addressed the students about his passion for music and how "there are reasons why God gives us gifts and talents." According to Cathy, his interest and talent in music not only helps him lead worship at his church, but it also aids him with his responsibilities at Chick-fil-a. Music stimulates creativity, which is something man in his position needs, he noted. Additionally, Cathy touched on the changing world of business. To him, long-standing companies, such as Chick-fil-a, run the risk of ceasing to be innovative and starting to be complacent. "My job as director of Chick-fil-a is recognizing what is changing and what's not changing," he said. Cathy also addressed the role his Christian religion has on his business practices. "If you want to be a champion of what you do, you need this," he said, holding up a pocket New Testament. "God's word is meant to make you strong and to encourage you." Cathy joined the Jazz Band, playing the theme song for the film "Ghostbusters" to close the convocation. Jimmy Lichtenwalter is a journalism and mass communication major and a news and feature writer in Samford's Office of Marketing and Communication.